There are a lot of days here in Kansas City when the heat is just too much and we moms have to find something engaging to do with our kids without fear of heatstroke. Last week was so warm, I didn't want to go outside at all. So we spent the week coloring endless pictures, reading books, using our imaginations, and - my favorite - heading to one of our most-loved local spots, Crown Center, for a day of fun. In addition to hosting amazing free kid-friendly exhibits that change throughout the year, Crown Center is the home of The Coterie Theatre - one of my favorite places in Kansas City! 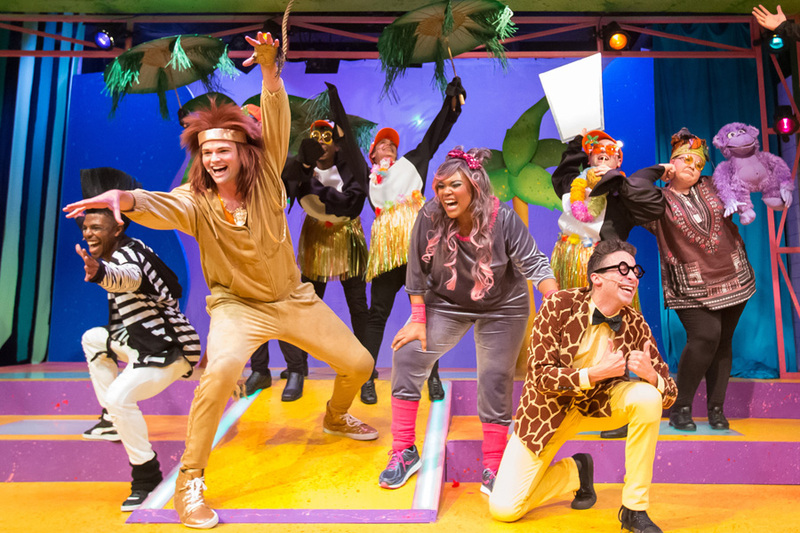 This summer, you'll find that The Coterie has been transformed into a tropical paradise featuring some familiar characters that kids will be delighted to see onstage: Alex the lion, Marty the zebra, Gloria the hippo, and Melman the giraffe! Lab for New Family Musicals in its 2015/2016 Season, June 14 – August 7, 2016. 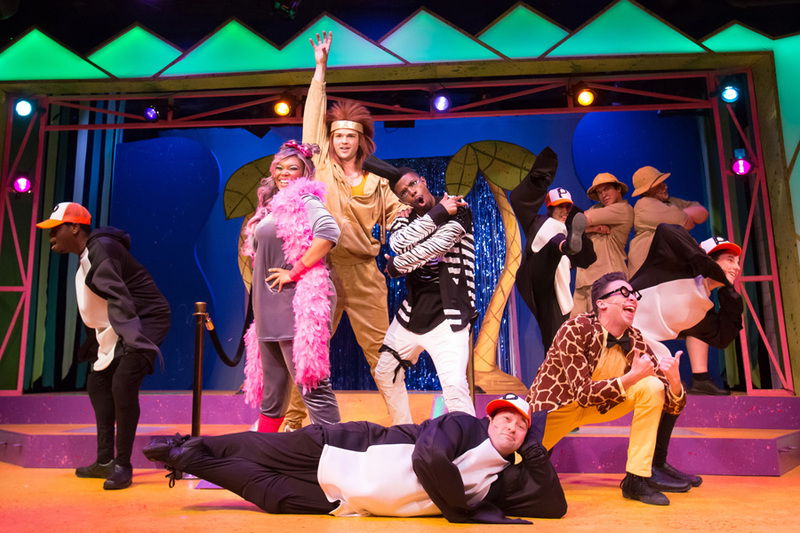 This world premiere show, Madagascar: A Musical Adventure follows the hilarious antics of these four rambunctious friends on their madcap journey from New York’s Central Park Zoo to the beaches of Madagascar. With ten memorable new songs added to a pop favorite from the original score, their journey goes from the wilderness to just plain wild when they are tracked by Skipper and his always plotting penguins, and then learn to “Move It! Move It!” from King Julian and his loyal lemur subjects. 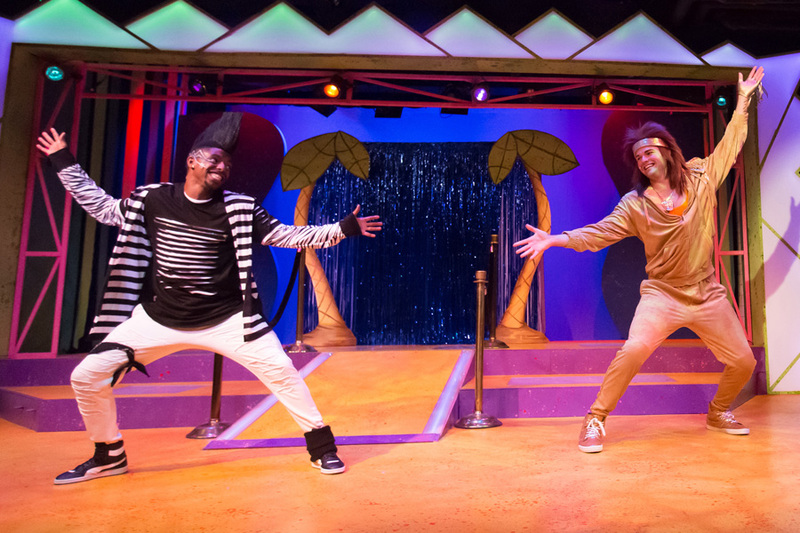 The story is brought vividly to life on stage by imaginative sets, colorful costumes, and a high energy, dance-filled production. We were able to catch a matinee performance of the show that was filled with children of all ages. Their energy filled the air with anticipation and before the show even began, we were treated to cast members teaching us several dance moves in preparation for the "Move It! Move it!" dance break partway through the show. The show features excellent pacing and the cast does a fantastic job of keeping their young audience engaged at all times. My kids are three and five years old and while they were a little fidgety, they never asked to leave the show. They were pretty mesmerized by the animal characters and asked questions about the story. My daughter (she's three) did not enjoy the "Foosa" song and hid her face for a minute, as she thought that was a little scary. But otherwise, she loved it - and once I told her that the "Foosas" were just people in costumes, she was okay. in its 2015/2016 Season, June 14 – August 7, 2016. Standout characters for me were the four primary animals: Marty (Donovan Woods), Alex (Patrick Beasley), Gloria (Enjoli Gavin) and Melman (Joey Boos). Each of these actors displayed personalities that were evident from every corner of the theater. The supporting cast was phenomenal, as well. The songs are catchy and led to much dancing in our seats as we watched the show. The "Move It! Move It!" dance break truly has to be experienced in person - you won't be sorry! It was so much fun. Plus, a big shout out to the writers, directors, or cast members who decided to throw in some references to other popular Broadway shows. I laughed until I cried when Marty the Zebra alluded to a certain recent Tony-winning production. You'll just have to go see it to find out what I'm talking about! 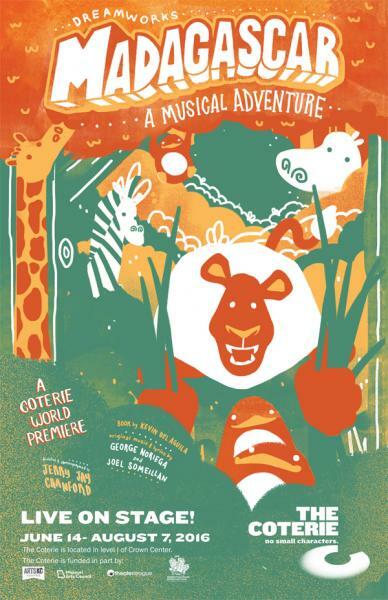 as part of The Coterie’s Lab for New Family Musicals in its 2015/2016 Season, June 14 – August 7, 2016. Friday, July 1, 8, 15, 22, 29, and August 5, 7:00 p.m.: Friday Family Fun Night. Post performance autograph session and photo op with cast members. Saturday, July 9, 2:00 p.m.: Interpreted performance in American Sign Language. 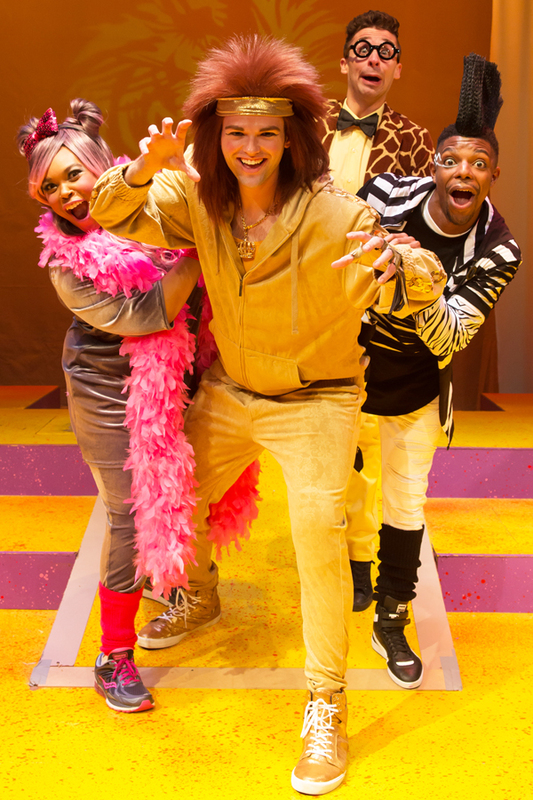 part of The Coterie’s Lab for New Family Musicals in its 2015/2016 Season, June 14 – August 7, 2016. Hats off to the entire crew and creative team for bringing to life a show that so many kids will recognize and enjoy. I am actually not very familiar with the original Dreamworks film, but I still had a grand old time. Get your tickets and head to The Coterie - just make sure you're ready to dance! If you're in Kansas City, you don't want to miss this outrageously fun show! 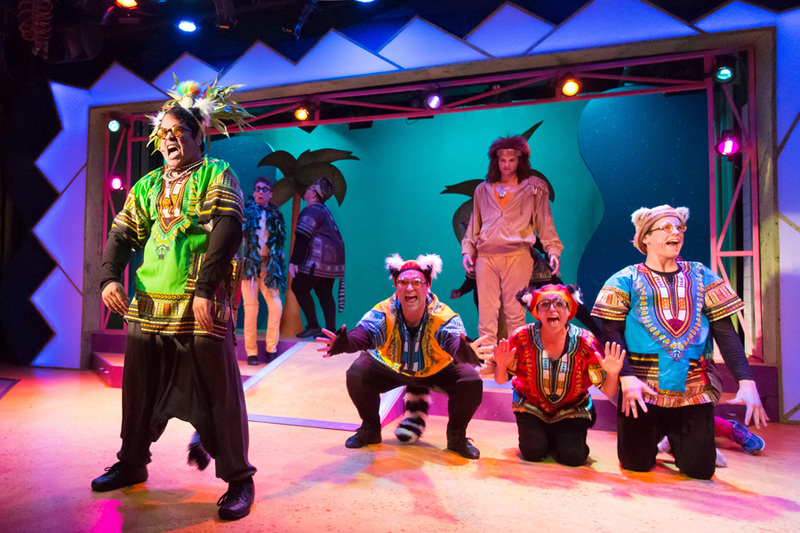 Madagascar: A Musical Adventure plays now through August 7 at the Coterie. Tickets are available online.